George Lambert, the president of T-Mar Industries in Campbell River, B.C., does not see himself as a visionary. But the need for a new steep slope grapple yarder specifically designed to address the increasing volumes of second-growth timber in B.C. became clear to him many years ago. “We did a study in 2009 that showed a few things,” Lambert explained. “That the proportion of second-growth harvest on the B.C. 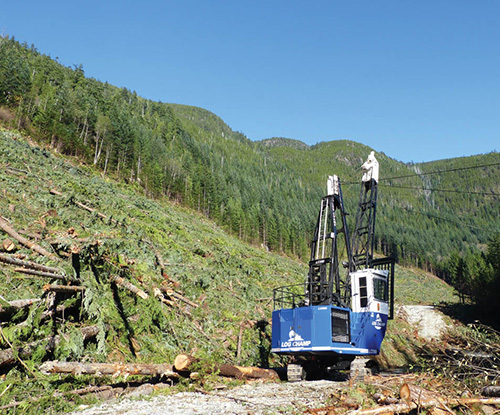 coast would increase significantly over time, and that the current fleet of grapple yarders is not suitable for second-growth harvest given their operating costs, size, and the lower value of logs that result from second-growth forests. The study also showed that WorkSafe BC regulations restrict the use of conventional, ground-based equipment on slopes over 40 per cent, the same terrain where the majority of grapple yarder harvest has taken place over the last few decades, and a forecast increase in steep slope harvesting in the B.C. Interior after the beetle. There was a particular focus on meeting the one-piece move criteria with the Log Champ 550. With an operating weight of 105,000 pounds, shipping width of 12 feet 6 inches and shipping height of 11 feet 6 inches, the entire machine can be moved as a single piece. The T-Mar design team has deep roots in the forest industry. Jim Mantle has a long history designing forestry machinery used on coastal British Columbia as the lead designer at Mantle Industries, and then lead designer at Cypress Equipment. In 1995, Mantle joined T-Mar Industries and assumed the role of engineering manager and lead designer. This allowed T-Mar to develop as a well-regarded manufacturer of forestry equipment. Mantle is highly regarded by the industry as one of the best designers of his generation. Ed Hughes was a senior engineer and designer at Madill Equipment from 1977-2008. Hughes joined T-Mar in 2008 to augment their engineering group and positioned T-Mar to be able to develop a new generation of forestry machinery. Hughes’ experience with grapple equipment design is unparalleled. George Lambert’s son, Tyson, joined the T-Mar team in 2011 and brought with him university training in computer technology and controls. His addition to the design team brought a new and unique system to the table. But with a sputtering forest industry in the midst of a global economic recession, why did T-Mar take the risk of engineering a completely new design when the forest industry was down and out? With the skills, experience and confidence that they could design something that would work for this new application, they decided to completely modernize the traditional machines including a new winch, power train, hydraulics, engine and superstructure to meet the design objectives, all with efficiency, speed, weight and transport in mind. There were plenty of challenges over the next four years as the machine came to life, with a particular focus on meeting the one-piece move criteria. The resulting Log Champ 550 (LC550) was designed using solid modelling in Auto Desk Inventor, a computer engineering design software that allows the building of a three-dimensional model, and then drawings to be pulled out. As a result, every part fits when it is manufactured. Stress and weight analysis can be done prior to ever building the machine. This program, which proved to be a key factor in T-Mar’s success, was traditionally used for fighter jet designs and has only recently become available for this type of application. The LC550 utilizes a Cat 9 litre engine, Cat CX28 Powershift transmission with lockup torque converter and five speeds forward, a new generation 25-inch Wichita regenerating clutch and, of course, the side by side winch, all built on a T-Mar designed mainframe utilizing a Cat Forestry undercarriage. The main drums have a 1,500 foot (3/4 inch) capacity and the haulback drum has a 3,100 foot (3/4 inch) capacity. The gantry is a 35-foot walking fairlead design. With an operating weight of 105,000 pounds, shipping width of 12 feet 6 inches and shipping height of 11 feet 6 inches, the entire machine can be moved as a single piece. 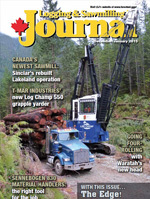 On its maiden voyage, the Log Champ is being used by new owners Southview Forest Services Ltd. on Redonda Island, on B.C.’s lower coast, yarding second-growth fir. But there is really more to the story. “I don’t believe the industry really understands the cost of downtime or the cost of lost productivity,” notes McKamey. “There are only so many yarding days in a year and we can’t afford to lose many. How does the downtime of a key piece affect the equipment down the chain? You can have a loader, processor, log trucks and an entire log sort that are all affected. A day of lost productivity in a camp results in enormous lost revenue. Yes, new equipment breaks down, but not as much as older iron”. And with the shortage of experienced yarder engineers and hook tenders in the industry, the decision became easy. “Will it be easier to attract people to run a new piece of equipment? We thought so—and in fact we have had applicants send in resumes with a note they would like to have a job on the Log Champ. Will it be easier to train young operators on the new yarder? We believe so,” smiles McKamey. But with a brand new state-of-the-art piece of equipment to own and operate, how did Southview Forest make financing affordable? “First, we discussed buying a new yarder with our banker. 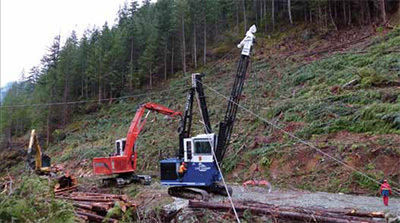 We demonstrated that grapple yarders do not depreciate like other pieces of logging equipment, and as a result amortized the purchase over six years which reduced our unit costs of production; that we had a reasonable balance sheet; showed some resale history; and we had the bankers’ confidence that we maintain our equipment well. “And with the shortage of grapple yarders in B.C., the value of well-maintained used grapple yarders is at an all-time high. We were fortunate to sell one and end up with a substantial down payment on the new one,” added McKamey. Jim Girvan, RPF, MBA, is the principal of MDT Management Decision and Technology of Ladysmith, B.C., where he provides consulting support in the areas of timber supply and fibre flow modeling and analysis, industry forecasting, statistical analysis, license acquisition and forest policy.